Cooker photos a photo by PhylB on Flickr. For want of something better to do, I thought I'd write a concise review of my cooker tonight. Here it is (above): two electric ovens, one slow cooker oven, one grill and seven gas burners: two small burners, three medium ones, one large and a giant wok burner. For starters the slow oven is a non-event - I use it to store baking trays. The ovens are fine, a good size and efficient, as is the grill. The burners aren't 100% ideal. It could use one smaller than the smallest, and one larger than the largest, but on the whole the burners do the job. So what's my gripe? Zoom in and look at the finish. At the bottom of both oven windows the metal has peeled away leaving rusty surfaces, presumably when water on condensation has run down the front of it. This happened within a year of buying it. More rust can be found on the top of the doors and along the rim of the hob. 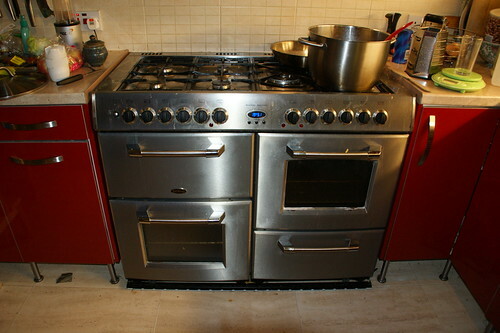 This is hardly what you'd expect from a cooker that is just two years old and cost over £1200. Surely at that price they don't expect you to replace it annually? So I won't be buying this make when this heap finally rusts away completely. European law says it's not fit for purpose at less than that .,., Talk to Derek .,., it was him who advised me ! We have the very same problem with our cooker which will be two years old in November.Paid €1,300 for it.Informed the supplier when the cooker was less than a year old, still waiting for the service man to call and inspect it.We certainly wont be buying another kensington,and neither should anyone that reads this. WHO TEACHES THE TEACHERS THESE DAYS?